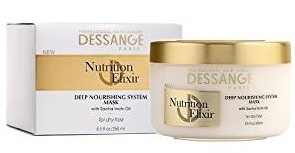 Today I am reviewing the Dessange Paris Nutrition Elixir line. 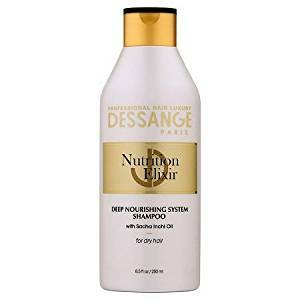 I have reviewed other Dessange Paris hair care lines before. This line is meant for hair that is dry and damaged. Read on for my review of the shampoo, conditioner and mask. Jacques Dessange believes every woman can achieve great hair with the right care and expertise. This has been his driving passion since his first salon opening near the Champs-Élysées 60 years ago. Now you can achieve a naturally elegant salon like result every day. Inspired by deep care treatments of Jacques Dessange's Paris salons, the Nutrition Elixir System of shampoo, conditioner and mask nourishes, protects and enhances hair so that it shines and has manageability. The system is infused with precious Sacha Inchi Oil and Provitamin B5, which transforms hair into a fluid and silky texture. This is for dry and damaged hair. How To Use: Apply evenly to wet hair. Massage and rinse. Repeat if necessary. My hair is damaged from coloring. I found this shampoo to be very rich and it really helped to help the damage in my hair. It made my hair silky and vibrant. All without disturbing the color. Also inspired by the deep care treatments given at the Jacques Dessange Paris salons, the Nutrition Elixir Conditioner nourishes, protects and enhances hair's shine and repairs damage. It is for very dry hair. The system is infused with precious Sacha Inchi Oil and Provitamin B5. It transforms hair into a beautifully fluid and silky texture. It is for very dry and damaged hair. How To Use: Apply evenly onto wet hair after shampooing. Leave on for 2-3 minutes. Then rinse. When used in conjunction with the shampoo, this conditioner makes hair so soft, silky and repairs damage that is done to hair by coloring, heat, etc. I love how it makes my hair feel. It also adds moisture to help dry hair. When hair is really damaged, use this mask to repair the damage and to make hair soft, silky and whole again. This Deep Nourishing System Mask is inspired by Jacques Dessange's salon treatments that are done in his Paris salons. The mask is thick and rich and really helps to restore hair to its natural state. It has Sacha Inchi Oil and Provitamin B5 which transforms hair into a fluid and silky texture. How To Use: After shampooing, apply on wet hair from mid length to the ends. Leave on for 3-4 minutes and rinse thoroughly. Use once to twice a week in place of the conditioner. I found this mask to be a blessing for my damaged hair. It really helps damaged and dry hair. It adds moisture to hair, repairs the damage and leaves hair feeling silky and manageable. 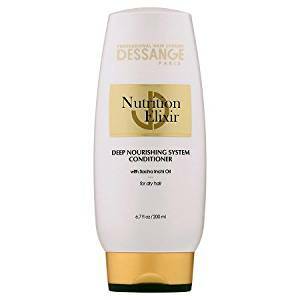 Dessange Paris Nutrition Elixir products are available from www.target.com and www.amazon.com. Though they are available from Amazon, the prices are exorbitant and I would steer clear of them. They are much less expensive through Target. They are also available at Target stores nationwide.